A.P.K. Safford, 1830-1891, served as governor of the Arizona Territory from 1869 to 1877. The 3,563-foot-high Safford Peak, at the northern end of the Tucson Mountains, is named for A.P.K. Safford, as is the town of Safford in Graham County. 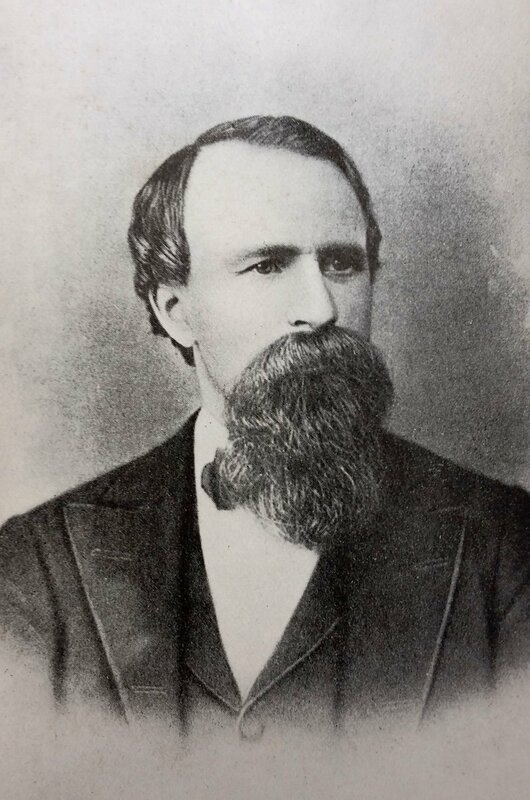 Anson Peacely-Killen Safford, prominent for his mining ventures, served as the third territorial governor of Arizona from 1869-1877. A native of Hyde Park, Vermont, he ventured to California to participate in its gold rush during the early 1850s. He later served as a mining recorder in Nevada before accepting the nomination as governor of Arizona Territory by President Ulysses S. Grant. His nomination was at the request of powerful railroad promoters including Coles Bashford who, like Safford, was also a fellow incorporator of the Atlantic and Pacific Railroad. Safford is known for his focus on law, order and education during his political tenure. But it was his mining ventures and unequivocal support for the railroads that secured him financial stability and helped exploit Arizona’s mineral wealth at the dawn of the Industrial Era. A notable “grubstaker,” Safford provided financing for prospectors in return for a percentage of their earnings in the claims they staked. The Trench Mine, patented in 1873, was one of the mines Safford, along with business associates R.N. Leatherwood, John W. Hopkins, Dr. J.C. Handy and Thomas Gardner, took an active interest in . It was known for a 4- to 10-foot vein of argentiferous galena and employed up to 50 men in the Patagonia Mountains. Safford became involved in early attempts to mine the placer deposits of Cañon del Oro in the Santa Catalina Mountains. He became vested in a new mining company established by Col. David Taylor, Isaac Goldberg, Thomas Ewing, C.E. Curtiss, John A. Meredith and M.W. Stewart. Safford served as the president of the company, and development began with an initial $1,000 investment to work a 4-foot vein of gold-bearing quartz. The Lee and Scott Mine (also known as the Nequilla Mine), several miles west of Tucson in what became known as the Amole Mining District, was another Safford enterprise. The original claim was staked in the mid-1860s with later improvements by Lee and Scott, who acquired the property in 1871. The claim was patented in 1872 and may have been the earliest patent in Arizona Territory. By the end of the decade, the mine had a 120-foot shaft with some trace amounts of gold produced and some silver ore, which was hauled to Guaymas, Sonora, and then to a San Francisco smelter for processing. Some of the silver was recovered onsite using the patio process involving mercury amalgamation. Silver was said to have run $60 to $125 per ton. By the 1880s, the mine played out with $70,000 in silver ore having been extracted. Safford later invested in the early mining development around Tombstone shortly after Edward Schieffelin’s rich silver discoveries. He held one-quarter interest in the Toughnut claim there, which he received in return for offering financial assistance for the building of a ten-stamp mill on the San Pedro River. He, along with Frank Corbin from New Britain, Connecticut, organized the Tombstone Gold and Silver Mill and Mining Co. and hired the services of Richard K. Gird to build a stamp and amalgamation mill that was fully operational by June 1879. Safford profited heavily from the selling of Schieffelin’s claims. While Schieffelin is said to have profited more than $600,000 from his Tombstone ventures, Safford may have earned more than $140,000. Safford was acutely aware of the need to enhance transportation opportunities from mine to market in Arizona. Serving as one of the early directors of the Southern Pacific Railroad Co., he was influential in guiding the railroad incorporated on Aug. 16, 1880, across the southern portion of the territory. That included the establishment of branch lines to the mining communities at Washington Camp in the Patagonia Mountains and those south of Tucson, including Oro Blanco and Arivaca. Safford would later attempt to finance an early branch line to Tombstone with Mark McDonald, a San Francisco mining stockbroker, but the attempt failed due to lack of financing. By the mid-1880s, Safford had left Arizona to speculate in lands in central Florida, including what became known as Tarpon Springs, incorporated in 1887. The Eastern Arizona town of Safford in Graham County is named for him. Hinton, Richard J. 1000 Old Arizona Mines. Frontier Book Co. Fort Davis, Texas. 1970. Lamar, Howard Roberts. The Far Southwest, 1846-1912: A Territorial History. UNM Press, Albuquerque, New Mexico. 2000. Raymond, Rossiter W. Statistics of mines and mining in the States and Territories West of the Rocky Mountains for the Year 1870. Washington, Government Printing Office. 1872. Shillingberg, William B. Tombstone, A.T.: A History of Early, Mining, Milling, and Mayhem. University of Oklahoma Press. Norman, Oklahoma. 2016. Zucker, Robert E. Treasures of the Santa Catalina Mountains: Unraveling the Legends and the History. BZB Publishing, Tucson, Arizona. 2014. The Bradshaw Mountains near Prescott produced a series of big strikes in the 1870s and '80s.